It’s been a few weeks but I’m back and hungrier than ever. After going on a 2 week long raw food/juice fast cleanse, then getting a nasty stomach bug, I’m ecstatic to rejoin the world of solid food! My first leisurely dinner at home in a while was awesome. Combine everything except basil in a skillet over medium heat until garlic starts to get fragrant, add basil at the end and cook for another 30 seconds or so, then set aside. While that stuff is cooking, in another pan with about 2 tbsp olive oil, caramelize 1 red onion, sliced, with a sprinkle of sea salt, over low-medium heat until browned. In another pan, fry up about 1 cup of tempeh, cut into squares, in about 2 tbsp of olive oil until browned. 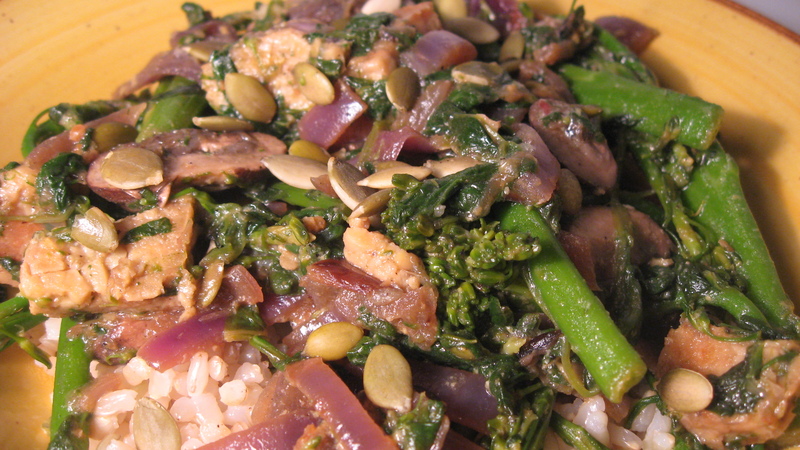 Toss everything together, and garnish with some pumpkin seeds and nutritional yeast. Serve on some brown rice.